The proposed penthouse at the top of the Woolworth Building was to be one of the most coveted living spaces in New York. 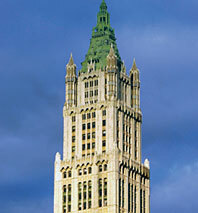 With five floors, 7,500 square feet, a private cylindrical glass elevator, and a terrace with sweeping views of nearly the entire city, the apartment would provide, as Corcoran Group CEO Pam Liebman put it, “tremendous ego gratification,” and cap off the conversion of the 1913 building’s slender Gothic tower into apartments. In 2000, the Witkoff Group, which owns the building, said it would add a screening room, wine cellar, cigar lounge, and spa under the building in hopes of luring residents east of the heart of Tribeca. But now nobody will; after gutting the tower, Witkoff is shifting gears. In another sign that the office market is hotter than the condo market, the Woolworth tower is being converted back to commercial space.